Nissan's current game plan seems to be working, as the company posted a 5% profit increase to a robust $1.1 billion, with sales growth beating the industry as a whole. There's CREAM, of course, but that's short-lived and can't explain everything. Nissan had strong sales in both China and the U.S., two markets where you gotta play if you want to make any money. Carlos Ghosn said the results were "satisfactory." I bet you don't think about the relationship between automakers and their Tier 1 (the most important tier!) suppliers, but having a healthy relationship means getting what you want, how you want it, when you want it. Which, hopefully, means money. And according to a new survey, the Big 2.5 are still not that great at it, with Nissan jump Ford in terms of overall relationship. Results of the study — which looks at things such as communication, help given to suppliers and supplier profit potential from hundreds of Tier 1 supplier surveys — are used by automakers to make improvements in working with suppliers that they hope can boost profitability and competitiveness. Suppliers may choose to share their latest technology and best pricing with companies that are more favorable to work with, analysts say. Here's a big recall that may not get so much notice, but Fiat Chrysler is recalling nearly 800,000 minivans due to an issue that actually led to fire (though no fiery death). According to Reuters, a power window vent switch may become exposed to moisture from, say, a kid spilling his milk, and the whole thing can short out, overheat, and then start a small fire. So yeah, maybe get that checked out if you've got a MY 2010 - 2014 van. While many analysts are decrying Musk's entrance into the battery business, one bond manager — Jeffrey Gundlach — thinks that's all Musk Should be doing and is trying to persuade him to get out of that annoying car-making business. Tesla "could be wildly transformational the way electricity and electromagnets were," the 54-year-old founder of DoubleLine Capital LP said yesterday in an interview with Matthew Winkler, editor-in-chief of Bloomberg News, at a forum at Bloomberg LP's headquarters in New York. "What does Twitter create? It creates information flow but it's not really creating anything. If you're going to buy a high-flier, I would rather own Tesla." The share price doesn't quite reflect that thinking yet. 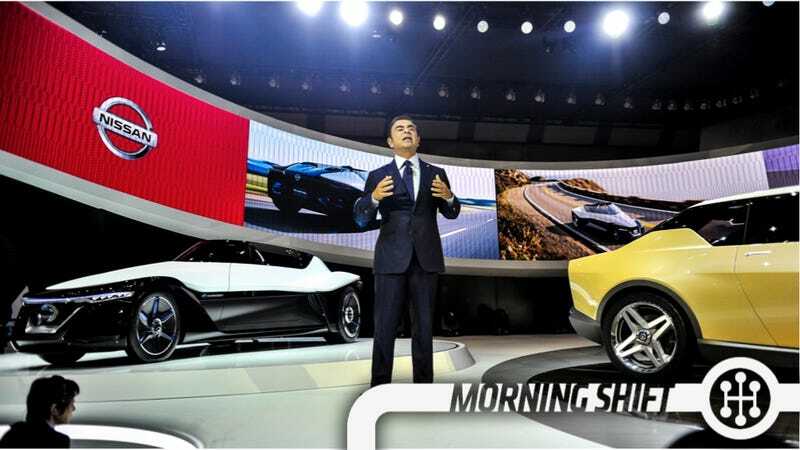 We've got a spot for Mahindra and, honestly, most Indian car manufacturing. Therefore, it's nice to hear that Anand Mahindra is out trying to hire some smart U.S. engineers to bring to the team. Mr. Mahindra told The Wall Street Journal that the Troy technical center, which could eventually employ more than 100 people, is part of an effort by Mahindra's automotive operation to develop vehicles that are more competitive with those offered by larger, global car makers. On this day in 2000, 19-year-old Adam Petty, son of Winston Cup driver Kyle Petty and grandson of National Association for Stock Car Auto Racing (NASCAR) icon Richard Petty, is killed after crashing into a wall during practice for a Grand National race at Loudon, New Hampshire. Neutral: Should Musk Just Build Batteries?